Located west of Mena, Arkansas the Eight West Equestrian Trail is a series of loops which take the rider to some of the higher elevations in the state and along ridges which allow for fantastic views and challenging terrain. Most of the loops cross creeks and some cross gravel roads, all of the trail is rocky. 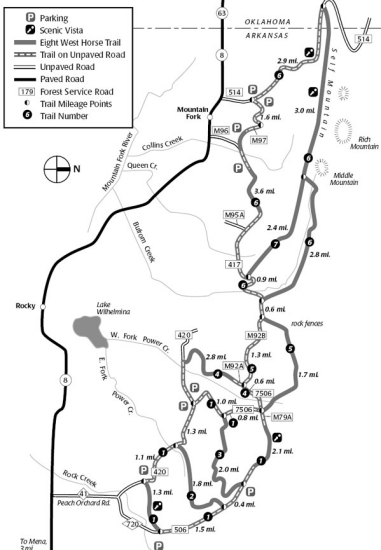 Distances vary from short 2 to 3 mile loops to 20+ miles and the trail can be accessed from several roads along Hwy 8 West.